Drive Angry wants so desperately to be a Neveldine/Taylor film. It wants to be Crank meets Ghost Rider, but it ends up feeling like a forced endeavor. It feels like a studio attempt to imitate the success of fringe, grindhouse appreciative filmmakers. 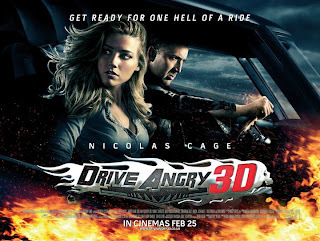 But in the end there isn’t much to save Drive angry from becoming quickly irritating. Even 3D couldn’t make this film enjoyable, and watching it in 2D only makes the desperate use of spectacle even more apparent. Without seeing the objects exploding (including fragments of skulls) floating out of the screen at you, it just looks like bad special effects. The disastrous attempt to make an edgy and violent film is painful to watch in Drive Angry. Part of the problem is the cast. Nicolas Cage just can’t seem to get back in the saddle. He makes more bad films than most actors. Before long he will have nowhere but the family film to escape to. Cage stars as Milton, a man who breaks out of hell in order to avenge his daughter’s death and rescue his granddaughter from a cult. Along the way he picks up Piper (Amber Heard), a tough waitress with a muscle car. Heard is at her worst and Cage is the same persona he has used countless other times. He can’t seem to find a haircut which looks tough on him. The highlight of the casting is William Fichtner as a bounty hunter for the dead. Some of his sequences, which eventually become repetitive, are among the only enjoyable moments in the film.